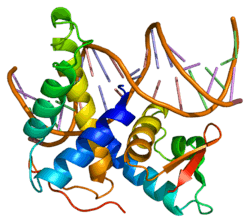 Transcription factor E2F5 is a protein that in humans is encoded by the E2F5 gene. The protein encoded by this gene is a member of the E2F family of transcription factors. The E2F family plays a crucial role in the control of cell cycle and action of tumor suppressor proteins and is also a target of the transforming proteins of small DNA tumor viruses. The E2F proteins contain several evolutionarily conserved domains that are present in most members of the family. These domains include a DNA binding domain, a dimerization domain which determines interaction with the differentiation regulated transcription factor proteins (DP), a transactivation domain enriched in acidic amino acids, and a tumor suppressor protein association domain which is embedded within the transactivation domain. This protein is differentially phosphorylated and is expressed in a wide variety of human tissues. It has higher identity to E2F4 than to other family members. Both this protein and E2F4 interact with tumor suppressor proteins p130 and p107, but not with pRB. Alternative splicing results in multiple variants encoding different isoforms. E2F5 has been shown to interact with TFDP1. 1 2 Sardet C, Vidal M, Cobrinik D, Geng Y, Onufryk C, Chen A, Weinberg RA (Mar 1995). "E2F-4 and E2F-5, two members of the E2F family, are expressed in the early phases of the cell cycle". Proceedings of the National Academy of Sciences of the United States of America. 92 (6): 2403–7. doi:10.1073/pnas.92.6.2403. PMC 42492 . PMID 7892279. 1 2 "Entrez Gene: E2F5 E2F transcription factor 5, p130-binding". ↑ Hijmans EM, Voorhoeve PM, Beijersbergen RL, van 't Veer LJ, Bernards R (Jun 1995). "E2F-5, a new E2F family member that interacts with p130 in vivo". Molecular and Cellular Biology. 15 (6): 3082–9. doi:10.1128/mcb.15.6.3082. PMC 230539 . PMID 7760804. Itoh A, Levinson SF, Morita T, Kourembanas S, Brody JS, Mitsialis SA (1996). "Structural characterization and specificity of expression of E2F-5: a new member of the E2F family of transcription factors". Cellular & Molecular Biology Research. 41 (3): 147–54. PMID 8589754. Vaishnav YN, Vaishnav MY, Pant V (Jan 1998). "The molecular and functional characterization of E2F-5 transcription factor". Biochemical and Biophysical Research Communications. 242 (3): 586–92. doi:10.1006/bbrc.1997.8010. PMID 9464260. Morris L, Allen KE, La Thangue NB (Apr 2000). "Regulation of E2F transcription by cyclin E-Cdk2 kinase mediated through p300/CBP co-activators". Nature Cell Biology. 2 (4): 232–9. doi:10.1038/35008660. PMID 10783242. Gaubatz S, Lindeman GJ, Ishida S, Jakoi L, Nevins JR, Livingston DM, Rempel RE (Sep 2000). "E2F4 and E2F5 play an essential role in pocket protein-mediated G1 control". Molecular Cell. 6 (3): 729–35. doi:10.1016/S1097-2765(00)00071-X. PMID 11030352. D'Souza SJ, Pajak A, Balazsi K, Dagnino L (Jun 2001). "Ca2+ and BMP-6 signaling regulate E2F during epidermal keratinocyte differentiation". The Journal of Biological Chemistry. 276 (26): 23531–8. doi:10.1074/jbc.M100780200. PMID 11319226. Chestukhin A, Litovchick L, Rudich K, DeCaprio JA (Jan 2002). "Nucleocytoplasmic shuttling of p130/RBL2: novel regulatory mechanism". Molecular and Cellular Biology. 22 (2): 453–68. doi:10.1128/MCB.22.2.453-468.2002. PMC 139733 . PMID 11756542. Apostolova MD, Ivanova IA, Dagnino C, D'Souza SJ, Dagnino L (Sep 2002). "Active nuclear import and export pathways regulate E2F-5 subcellular localization". The Journal of Biological Chemistry. 277 (37): 34471–9. doi:10.1074/jbc.M205827200. PMID 12089160. Chen CR, Kang Y, Siegel PM, Massagué J (Jul 2002). "E2F4/5 and p107 as Smad cofactors linking the TGFbeta receptor to c-myc repression". Cell. 110 (1): 19–32. doi:10.1016/S0092-8674(02)00801-2. PMID 12150994. Macaluso M, Cinti C, Russo G, Russo A, Giordano A (Jun 2003). "pRb2/p130-E2F4/5-HDAC1-SUV39H1-p300 and pRb2/p130-E2F4/5-HDAC1-SUV39H1-DNMT1 multimolecular complexes mediate the transcription of estrogen receptor-alpha in breast cancer". Oncogene. 22 (23): 3511–7. doi:10.1038/sj.onc.1206578. PMID 12789259. Ohtani N, Brennan P, Gaubatz S, Sanij E, Hertzog P, Wolvetang E, Ghysdael J, Rowe M, Hara E (Jul 2003). "Epstein-Barr virus LMP1 blocks p16INK4a-RB pathway by promoting nuclear export of E2F4/5". The Journal of Cell Biology. 162 (2): 173–83. doi:10.1083/jcb.200302085. PMC 2172795 . PMID 12860972. Jiang Y, Saavedra HI, Holloway MP, Leone G, Altura RA (Sep 2004). "Aberrant regulation of survivin by the RB/E2F family of proteins". The Journal of Biological Chemistry. 279 (39): 40511–20. doi:10.1074/jbc.M404496200. PMID 15271987. Swetloff A, Ferretti P (2006). "Changes in E2F5 intracellular localization in mouse and human choroid plexus epithelium with development". The International Journal of Developmental Biology. 49 (7): 859–65. doi:10.1387/ijdb.051996as. PMID 16172982.